Retired Col. Mohammed Sambo Dasuki, former National Security Adviser (NSA), said he needed to consult relevant documents to enable him to recall any transaction with former PDP spokesman, Olisah Metuh standing trial over alleged N400 million money Laundry case. Dasuki made the demand at a Federal High Court in Abuja, when he appeared as a witness in the ongoing trial of Metuh. The former NSA, who was led in evidence by Mr Emeka Etiaba (SAN), counsel to Metuh, told the court that he had been in the Department of State Security Services custody since December 2015. He said that he could not remember if he had any dealings with Metuh in 2014 in respect to the amount for which the Federal Government was currently prosecuting him. 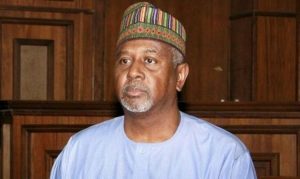 When Etiaba sought to know when he thought he would have access to his records, Dasuki said that would be possible as soon as the authorities holding him released him on bail. “I am unable to answer any questions in regards to his charge without consulting my records. “I stated earlier that I have been in custody so it is only when the authorities holding me decide to obey the three bail orders granted by three different courts and one ECOWAS court judgement asking that I be released and release me, I do not know,” Dasuki said. He, however, told the court that he was awaiting a Supreme Court ruling concerning his release on bail. At this point, Etiaba told the court that the witness was willing to testify but needed time to access his records in order to help the court in the matter. He prayed the court to grant an adjournment and direct those holding the witness to allow him to have access to his records. According to him, the directive that Dasuki should be produced in court has been honoured and so this new directive should also be honoured. Mr Tochukwu Onwubufor (SAN), counsel to the second defendant, aligned himself with the submissions of Etiaba, noting that an adjournment was necessary to allow the witness consult his records. The prosecuting counsel, Mr Sylvanus Tahir, however, opposed the application for an adjournment. He based his argument on the grounds that some of the documents needed to be used to cross examine the witness such as the e-payment mandate were in the court’s records. Tahir asked the court to discountenance the arguments canvassed by Dasuki’s counsel, Mr Ahmed Raji (SAN) that his client was not in the right frame of mind to give evidence, having been incarcerated in the last two years. He said that this was because there was no medical report before the court to prove it. The prosecutor urged the court to compel the two defendants to make use of documents already tendered as exhibits in court and not entertain the application for adjournment. The judge, Justice Okon Abang adjourned the matter until Friday to rule on the application for adjournment. The judge had earlier struck out a motion argued by Mr Mike Ozekhome (SAN) on behalf of former President Goodluck Jonathan in which he prayed the court to set aside the subpoena issued on him. Abang struck out the motion on the ground that he had no jurisdiction to entertain the motion because Jonathan had not been formally served with the subpoena as required by law. He said that the former president could only raise issues against the subpoena after he was duly served. The judge had also dismissed an application by Dasuki asking the court for an adjournment in respect of the subpoena on him and pending the determination of his appeal in the Court of Appeal. He said that since Dasuki was not a defendant but a witness in the matter, he had no “locus standi” to seek for an adjournment.